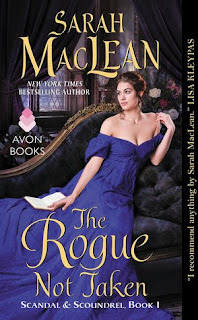 The Rogue Not Taken is book one in the Scandal & Scoundrel series. This is such a promising start to a series and I cannot wait to get my hands on the next book, I really enjoyed Sarah MacLean's writing style. It had a touch of humor mixed in with romance which I'm always a big fan of. And the characters were attention grabbers for sure. The book opens with a big splash as Sophie, the youngest Talbot sister, pushes her brother-in-law into a pond. You see, she caught him cheating on her sister and he had no qualms against doing so. Knowing the scandal sheets will go nuts over the story Sophie decides to leave as fast as she can. She might have climbed into the wrong carriage though and winds up discovered by a not so happy Marquess. Kingscote, the Marquess of Eversley is convinced Sophie is trying to corner him into marriage when really that's the furthest thing from the truth. Eventually he understands and the duo wind up travelling together. Sparks fly, and I could just see Kingscote falling for Sophie despite his attitude towards her. Sophie won me over from the very first page by sticking to her guns and protecting those she cared about. She didn't care to be one of the fancy people, she wants to go back to her roots before her family got their title and it just really made me enjoy reading her story. With intriguing characters, and an entertaining plot this story was a must read. If you're a fan of Historical Romance with a bit of humor you have to pick this book up. I noticed you love Historical Romance and everytime I read your reviews, I keep adding more of them in my TBR. I guess it's high time that I finally read one soon hehe. Awesome review! Sounds like fun...I'm about to dig into a historical holiday romance...can't wait. Oh yay, that sounds fun!! This one sounds like something I'd enjoy. If I was reading historicals. I'm a bit burned out on historicals at the moment. Humor is a good selling point for me to want to read a book :D I love that you became immediately invested in Sophie's story due to her personality and I'm glad that you enjoyed it so much! Great review! Oh yes, I think you'd love it!